Are you frustrated with Facebook’s frequent changes to the news feed algorithm?Do you feel like you’re being forced to buy ads to reach your audience? While Facebook change is the rule rather than the exception, this article gives you 18 ways you can improve your Facebook news feed performance—and gain the upper hand. Facebook defines reach as the number of unique Facebook users who see your updates. 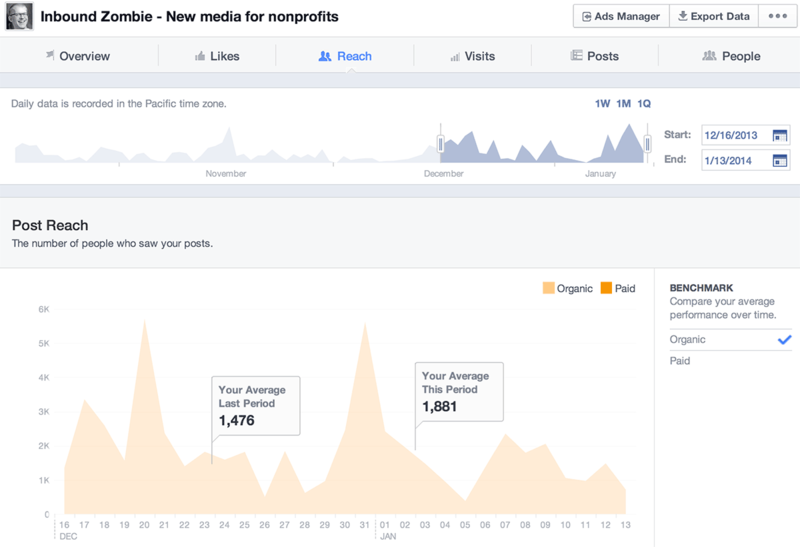 To see your page’s reach, go to Facebook Insights and look at your page’s Reach report. You’ll be able to see how your reach is improving over time (as shown below). How much reach does your Facebook page have? You post content to your Facebook page. Yes, most of your fans don’t see it, but it still generates reach. Facebook calls this organic reach. Facebook users take action on that update (like, comment, share), which creates a story in their friends’ news feeds. Facebook calls this viral reach. You send visitors to that update using your own marketing channels. 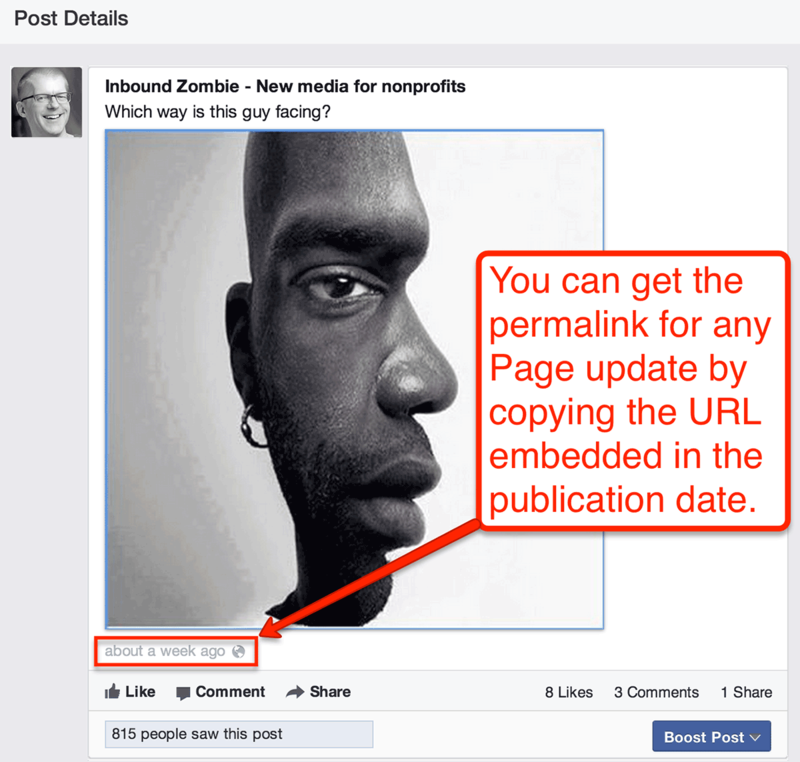 An example would be linking to a specific Facebook update in your email marketing newsletter. This also falls within organic reach. You buy reach with Facebook ads. Facebook offers a variety of ad options, including boosts and targeting custom audiences. Facebook calls this paid reach. All four actions are interrelated. For example, if you publish content (organic reach) that your fans react to, friends of those fans will see that content (viral reach). If you decide an update is worthy of a Facebook ad, then the ad creates paid reach. The more kinds of reach you generate with an update, the more people see that update. And that’s where these 18 ways you can beat Facebook’s news feed algorithm come in. You’ve heard this before, but what really matters in the end is the content. Your fans don’t share a post just because they see it the news feed. They share it because it’s useful and interesting to them. In the nonprofit world, fewer than 25% of pages have a content strategy, and I’ll bet that’s true for most small businesses as well. When is the best time to post on Facebook? When most of your fans are actually using Facebook. In general, Facebook shows the most recent content at the top of the news feed. If you post an update at 2am, but your fans are using Facebook at 8am, you can be sure they aren’t seeing your updates. You can find out when your fans are online by going to your Facebook Insights and clicking Posts. Post when your fans are on Facebook to ensure maximum reach. After looking at your Post Insights, you probably noticed there’s never a period whennone of your fans are using Facebook. This means you should post at least once per day. Socialbakers recommends no more than twice a day, based on their research. When Facebook users post updates on your page or mention your page, their friends see that activity in the news feed. That’s important viral reach. In the update below, Max has posted an update on the Libraries Are Essential Facebook page. Many of Max’s friends will be exposed to this page through viral reach because his post shows up in his friends’ news feeds. If you’re worried about spam or negative content being posted on your page, don’t worry. You can easily configure your page to block content that contains specific keywords or profanity. Any time someone posts on your page, it shows up in their friends’ news feeds, which results in viral reach. 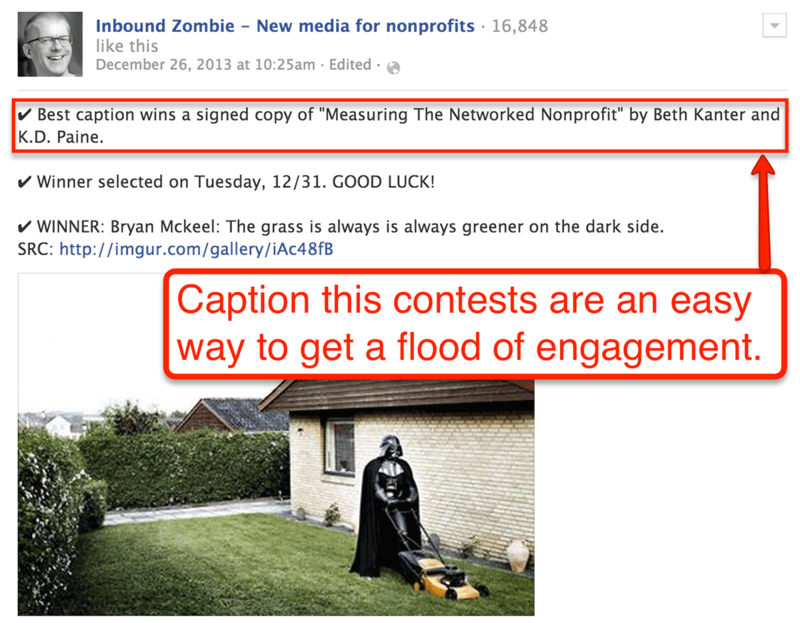 One thing I’ve done that’s consistently worked well is to host caption contests as a way to generate an instant flood of comments, which in turn creates a flood of viral reach! Fun and easy contests or giveaways result in higher organic and viral reach. I give away copies of great books, but you can give away anything you want. Justmake sure it’s useful and relevant to your community. To build community, you have to listen to and respond to community. People use Facebook because they want to be heard! Responding to comments is important. Reply to your commenters so they know they’re heard. Your Facebook page has an optional threaded comments feature. This means that when a fan leaves a comment on an update, you can reply specifically to that comment. When you respond, that fan receives a notification, which is incentive to revisit your page to read your response. Increasing the frequency of visits to your page is a key part of developing a core Facebook page community. Go to your page and click Edit. Find the Replies heading in the list and click Edit. Click Allow Replies to Comments on My Page. Normally, pages can’t tag people on Facebook, but there is one exception: If a Facebook user leaves a comment on an update, you can tag the user when you comment on that same update. Tag commenters in your reply to bring them back to the conversation. Depending on the users’ privacy settings, they’ll receive notification that they’ve been tagged, prompting them to revisit the thread. Human beings are hardwired for reciprocity. Generally speaking, when you promote another business’s agenda on Facebook, they receive a notification so they know the good deed you did for them. If they’re a good partner, they’ll return the favor. Your content strategy doesn’t have to only include new content; you can also recycle your most successful posts to reengage fans. To find and reframe your top-performing posts, you need to know post engagement rates—the percentage of people who saw an update and liked, commented on or shared it. 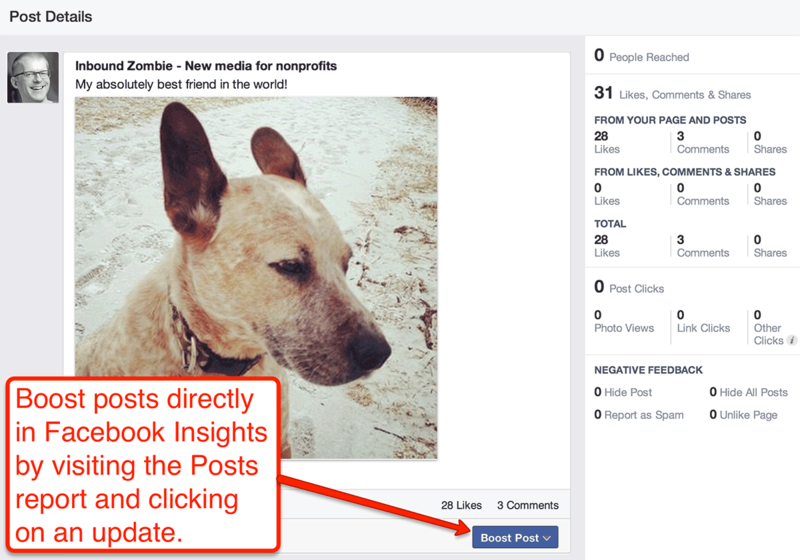 To find post engagement rates, go to your Insights and click Posts. Scroll down to the All Posts Published table, and click the Engagement column to quicklysort your posts by engagement rate. To really get a feel for which updates your fans loved, export at least six months of post-level data and study it. Click Share on the original post and share it directly on your page. Copy and paste the original post into a new status update. Modify the original post, then post as a new status update. An important note here: Don’t recycle recent content. You don’t want fans to feel like they’re seeing reposted content too frequently. There’s no way to escape it. If you’re serious about Facebook marketing, use ads. What I will say is this: Only promote awesome. Investing in posts that already have a high engagement rate is more likely to give you the biggest bang for your buck—more likes, comments and shares—which translates into more engagement and reach in the long run. Whether you have experience with Facebook ads or not, make time to read Jon Loomer’s articles on using Facebook Ads and the Power Editor to promote your top-performing posts. 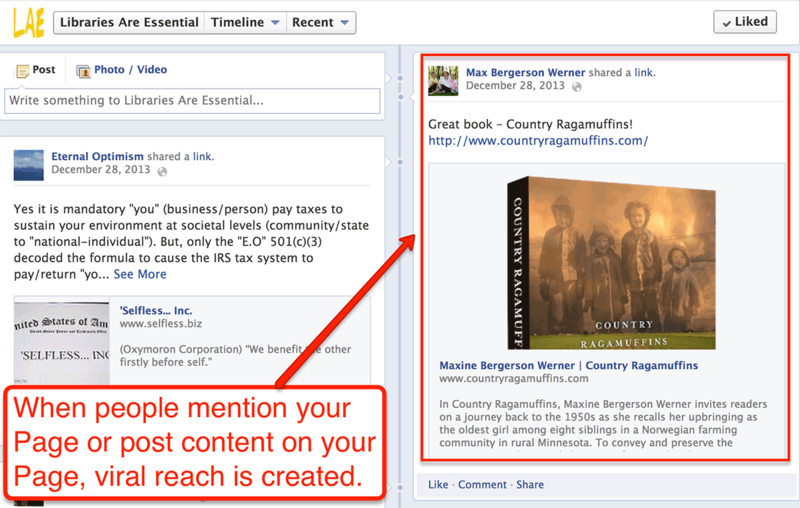 Promote your best Facebook content easily right from Insights. Most people don’t know that the Facebook Like box in their website’s sidebar has a setting that lets you display your most recent page updates. When people see your Facebook updates in your sidebar, it not only encourages them to like your page right there, but to click over to your page and take part in the conversation. To update your Like box, visit the plugin page and configure the settings to Show Posts (as shown below). 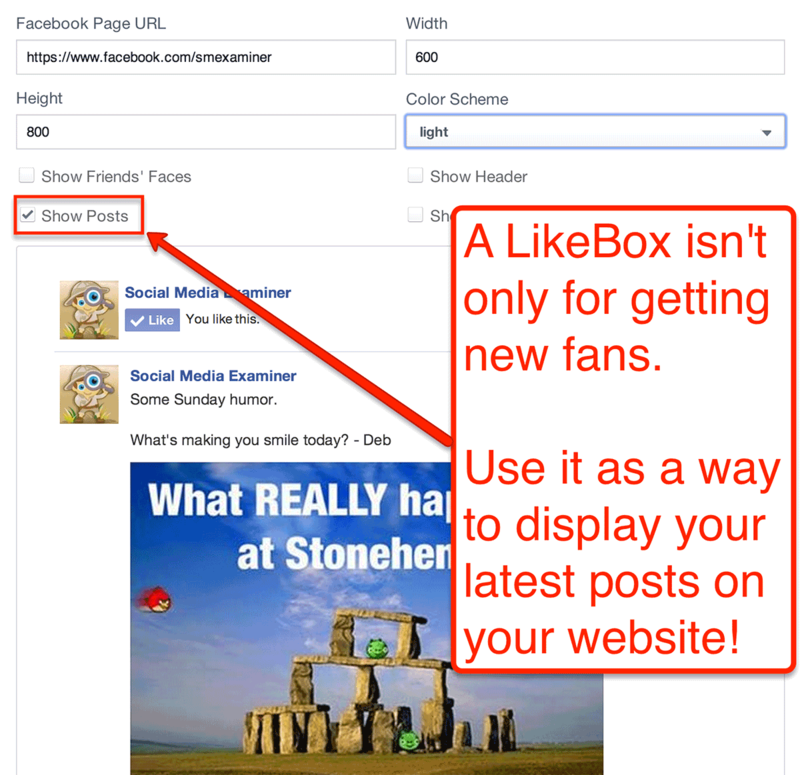 Sharing your Facebook updates in your sidebar Like box lures people to your page. One constant challenge for most bloggers is finding topics to write about. Take a look at your most recent high-engagement Facebook updates and write blog posts that expand on those topics. 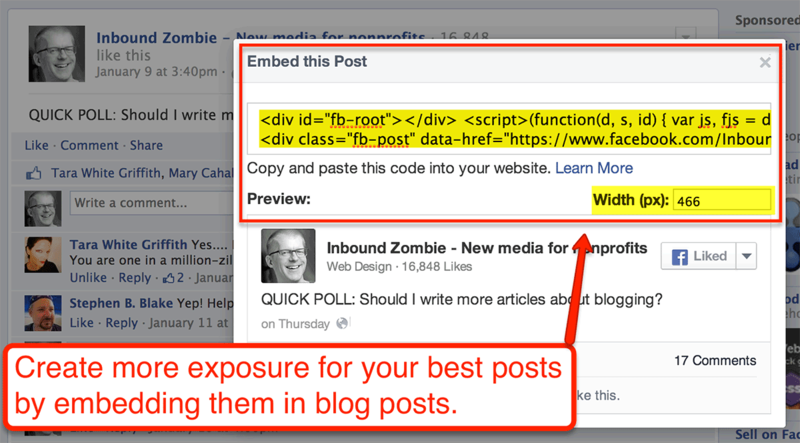 Within the post, embed one or more of your best Facebook page updates (as shown below). Write blog posts around your popular Facebook topics and provide a way for readers to revisit the conversation on Facebook. This approach not only creates more reach for your best Facebook updates, it gives you blog post content that’s already been vetted by your community! Have you hit a wall on your way to getting engagement? Depending on the strength of your collective friend network, try asking for shares or comments from within your personal networks. Now, obviously you can’t force people to do this. But you can have willing parties message their friends at a time when you know your fans are mostly likely to be online. These network shares cause a trending effect among friends connected to your business. When people see several of their friends talking about a topic, they’re more likely to be interested in that topic and click over to read more. If you’re a regular reader of Social Media Examiner, you know how powerful having aguest blogging strategy can be for growing your business. But did you know you can find potential leads for guest-post opportunities right in Facebook Insights? Within the Visits report, scroll all the way down to the External Referrers section. This graph shows you which websites are referring the most traffic to your Facebook page (shown below). Keep track of who’s sending traffic your way and make the most of those partnerships. Contact the sites sending people your way and see if you can write a guest post for them. Don’t limit yourself to guest blogging. Feel free to explore other co-marketing opportunities that may work as well. When you post images to Pinterest, you have an option to include a URL. When a user clicks the image, they go to that URL. Try reposting a few high-performing photos from your Facebook page onto Pinterest and linking back to your Facebook update. Make sure you use the correct permalink for the post! 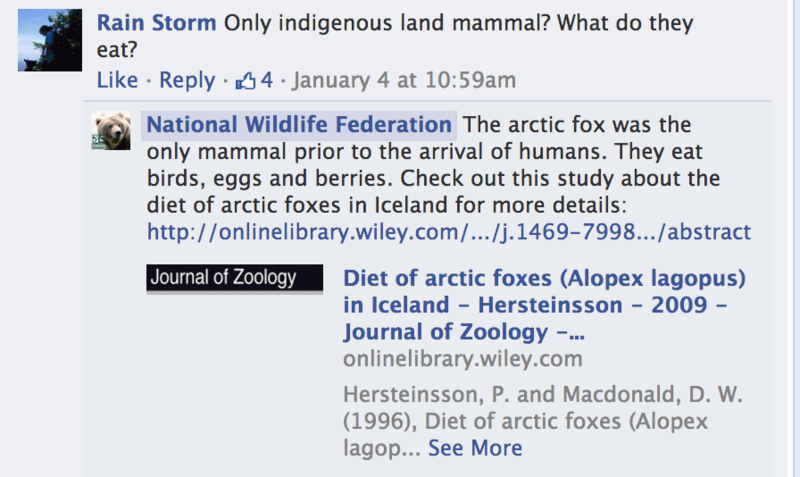 You can find that by clicking on the post’s publish date on Facebook (as shown below). You’ll be taken to a new page that shows just that post. Copy the URL for this page to use as your Pinterest link. Use eye-catching images on Pinterest that link back to your Facebook page. Keep track of how much traffic Pinterest is sending to your Facebook page via your Insights’ External Referrer graph. Then you’ll be able to determine how effective this approach is in boosting reach for your Facebook page updates. 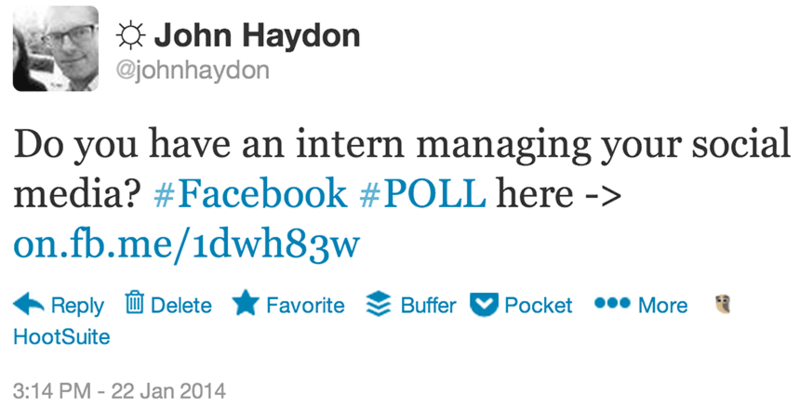 Some of my clients have had success scheduling tweets with links to their high-performing Facebook updates. Two or three tweets in 48 hours is plenty. Tweet recent Facebook updates rather than older ones. Tweeting a Facebook post drives external traffic. Make sure you’re able to measure clicks from Twitter to the post. 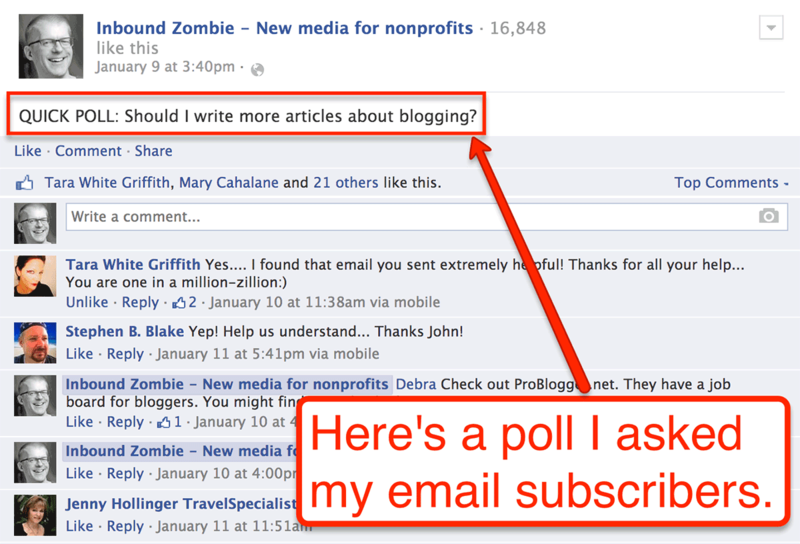 This is one of my favorite strategies to use for my Facebook page. It’s so simple and effective, I’m surprised I don’t see it done more often. Every time I write my weekly newsletter, I include a link to a Facebook page update. For example, I recently asked my subscribers if they’d like me to write more about blogging, then I provided a link to a Facebook post where they could answer. People who open and read your emails are highly likely to engage with you on Facebook as well. In the end, you have to find the tactics that work for your Facebook page. 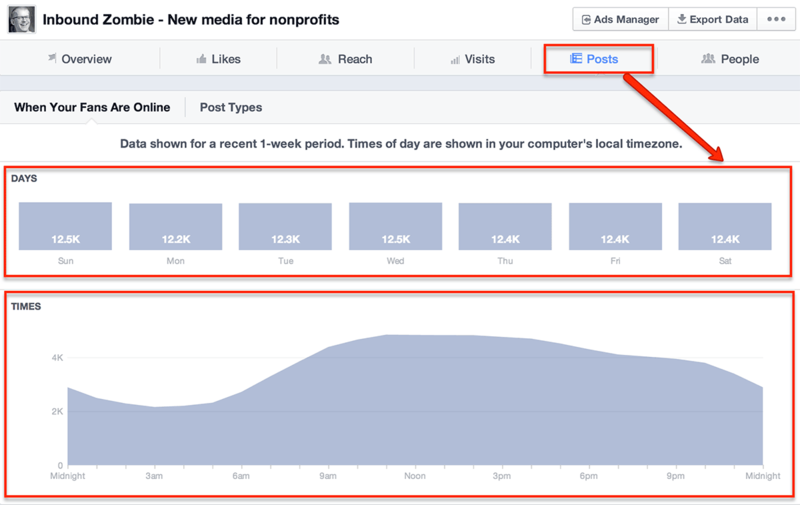 Export the last six months of your Facebook Insights and study them to see what works for your page, then replicate that success with the tips above. Pay attention to which updates resulted in new fans. Look at which posts produced specific kinds of reach and engagement (shares are more important than likes, for example). I must say this blog loads a lot faster then most. Can you recommend a good internet hosting provider at a honest price? I have been with GoDaddy for about 4 years. I have been very happy with them and consider their prices competitive. Hello I am using Godaddy to host my sites! They are reasonably priced and have an amazing support staff.